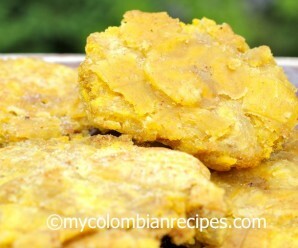 Patacón is one of my favorite Colombian dishes. We use it as a side dish with our seafood or as an appetizer served with our Colombian sauces. We make a large version of these delicious things called tostadas de plátano and this recipe is just one example of the many variations of tostadas. Hernan Patacón is a restaurant in Colombia. I know there are a couple in Medellin and Capurgana, but I am not sure if there are more in the rest of the country. When I lived in Colombia, I used to go there a lot with my best friends and we loved the giant Patacones with different toppings. If you ever go to Colombia, you must find one of these restaurants, the Patacones are absolutely delicious! 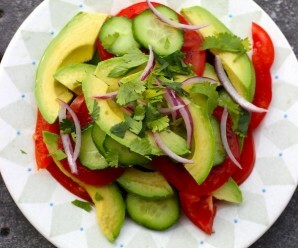 I will be posting other tostadas recipes with my favorite toppings soon! In a large heavy pot, add enough vegetable oil to cover the entire plantains and heat the oil over medium high heat. Add the plantains to the heated oil. Fry for about 10 to 15 minutes per side. Carefully remove the plantains with a slotted spoon, and place them on a plate lined with paper towels to absorb excess oil. Let the plantains cool for 3 minutes. Then, place the plantains on a piece of plastic wrap and cover with another piece of plastic wrap. With a flat pot cover, press well the plantains, flattening them about to ¼” thickness. Dip each slice in salted water. Then using tongs add them back in the hot oil in a single layer (need to work in batches) and fry for an additional 3 minutes on each side. Be careful when you fry the soaked plantains, as droplets of water will cause the oil to splatter. Remove the tostadas with slotted spoon and transfer them to a plate lined with paper towels to absorb oil, sprinkle with salt, to taste, transfer to a serving plate and serve hot with guacamole, hogaoand aji on the side. I will have to try this one soon. We love plantains but are terribly impatient to wait until they ripen. This recipe almost sounds like cheating, which works as it means we get to have this tasty dish that much more often. Wow…this looks very exotic…have never tried anything like this, I would love to though. I always make these but in slices 🙂 I will have to try them whole and fried. This reminds me of when we go up to New Jersey..they have a restaurant called. Banana King and they have some of the best food! They serve these with like a carne asada with queso blanco on top..and a variety of other toppings! Can’t wait to see the toppings that you will post later! I always eat tostones with hogao. I was wondering if the step dipping it in water made a big difference? I notice in some of my cookbooks it says to, but some don’t? Felisha, The salted water makes the patacón crispier! Hola! I love your recipes. I’m a Hispanic American from south Texas, and I love Latin foods. Thank your for sharing your special skills and gifts from God. Thank you, Yoli. I appreciate it! Que buena pinta que tiene ese plato!!! 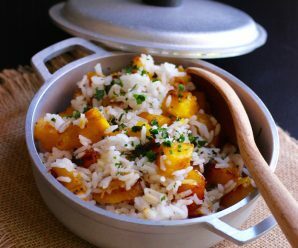 it is eerie…Haloween and all…:) but bengalis have this dish with Plantains ( one of my favorites and I will write about it soon) which uses plantains. And I made it yesterday. Amazing you have one today. And plantain is not that common a choice too as a veggie! Awesome looking. You colombians know your food. For sure ! Glad I have access to one of the best! Colombian food is always so tasty ! 😀 YUMMY !!!! oh yum! I’ve made plantains once (a different version) and the family enjoyed them. I bet they’d like this too…especially with those sauces. 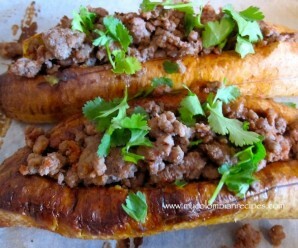 Oh my, I love plantains and this just makes me drool! Sounds like a fantastic delicious way to prepare plantains, can’t wait to try! Thank you everyone for taking the time and leave a comment! I need to get my hands on some plantains. I’ve never cooked with them, but my husband really liked them. When I looked at the photo, it somehow reminded me of the couple of times I had bandeja paisa. I’m still working off lbs. since the last time! Technique is basically the same as making tostones (fry twice/dip in salted water). I love plantains! This looks delicious! that’s something new to try; I love green plantains, it’s been a long time since I ate them! Green Plantains and Yellow (sweet Plantains) are part of the Latin Culture. We eat this in Cuba, Puerto Rico, Republica Dominicana, Colombia, Venezuela and my Beautiful Country PANAMA :). Im really thinking about opening a restaurant in the US with all the nice dishes we have in Panama and the rest of this countries. You can Eat green plantains with EVERYTHING. Currently following your recipe, super excited to taste the finish product! I saw someone mentioned a restaurant called banana king here in NJ! I get this all the time there & I’m in love!! The pink sauce (ketchup & mayo) is awesome with this as well. Thank you!